Roche Colombe is a stunning looking hill in the Drôme department in south-eastern France. The Drôme flows from the Alps through a beautiful valley until it reaches the mighty Rhône. North of Provence, the Drôme department is just as beautiful but quieter and with plenty of campsites. Walk or cycle around this area and you will stumble upon tidy rows of vines, colourful fields of lavender and quaint medieval villages. You can hop along the river staying at a different campsite every night and we certainly tried out many of them as we slowly explored this fantastic area that has so much to offer. From the attractive village of Saou we set off up the 886-metre high Roche Colombe on a way-marked route. Roche Colombe is one of the hills in the dramatic Synclinal de Saou where the limestone layers have shifted to a 45⁰ angle. The rocky slopes of the mountain end with a sheer high cliff. Sections of the path require a bit of a scramble but the hike up Roche Colombe is breathtaking and worthwhile. At the summit I sat on this bench and took in the spectacular views along the length of the Drôme Valley. France does not have the same tradition of erecting memorial benches that we have in the UK and I don’t feature many from other countries. I decided to photograph this bench on Roche Colombe as it was certainly very much appreciated after all that climbing and, most importantly, it had a plaque. The plaque says that on 12 June 1993, the bench was repaired by the friends of Aouste sur Sye, a nearby village below Roche Colombe. Thank you! You can find details of a walk up Roche Colombe here and other walks in the area here. I have gained some new followers recently on this memorial benches blog, thank you and welcome. I am pleased that there are other people out there who are interested in this project I have been working on for some years. If you are interested in travel, campervans and living frugally then you might want to take a look at and perhaps follow my other blog that I call ‘Back On The Road Again.’ I have been writing this blog for a couple of years and by following the blog you will get all the latest news on places we have visited and how we endeavor to live a sustainable and purposeful retirement that is within our limited means. In the spirit of mutual support I always follow fellow bloggers back and I enjoy keeping up-to-date with the journeys everyone is taking. I was enchanted by the walled town of Elvas in Portugal. Near the Spanish border this is a lovely town with complex walls, a castle, a handsome square and the beautiful Chapel of Igreja das Domínicas. Exploring the narrow streets we came across the British Cemetery on the edge of the city occupying one of the seven bastions in the fortifications. This is one of the oldest British military cemeteries and has five known graves, two died at the Battle of Albuera (1811) and one at a siege of nearby Badajoz; thousands of British soldiers died in both these battles. Elvas held a key position in the Peninsular War (1808 – 1814) facing Badajoz in Spain and the cemetery was opened in 1811 for the body of Major General Daniel Hoghton, who died at Battle of Albuera. Today Elvas is a fascinating city that is deservedly a UNESCO World Heritage Site for its extensive fortifications. The British Cemetery (the Portuguese call it the Cemitério dos Ingleses) fell in to disrepair until 1997 when the small British expat community, with help from the Portuguese army, renovated the neglected cemetery and took over responsibility for its ongoing maintenance. Today it is a peaceful and attractive spot with views over the plain towards Badajoz. In memory of Victor Hunter Reynolds 1901 – 1985 and to recognise his services to the Allied cause in World War II, assisting the escape of Allied servicemen and refugees from occupied Europe through Spain and Portugal. His lifelong interest in this place was a reflection of his admiration for the 1st Duke of Wellington. I don’t often include memorial benches from other countries for the simple reason I rarely find them in other European countries. In this British Cemetery the custom of memorial benches has been exported and I discovered this moving tribute to Victor Hunter Reynolds. I was lucky to come across this full and interesting account of Victor Hunter Reynold’s life translated from an article written by Alberto Franco in 2004. Victor Hunter Reynolds was born in Lisbon in 1901, his father from Anglo-Portuguese wine and cork merchants and his mother from a Portuguese banking family. The family moved back to England for a short time, returning to Portugal in 1917. Victor went to work for an uncle on his estates and learnt to speak Portuguese and when his uncle died he took over the management of the Quinta do Carmo near Estremoz (still a wine producing quinta). In 1936 Victor Hunter Reynolds was very much affected by the bombing of nearby Badajoz and as, ‘the frontier was only a short distance from his estates, and as an Anglo-Portuguese, Victor could not ignore the thousands of Spanish refugees who crossed the frontier in search of safety. In common with many Portuguese, Reynolds lent a hand to the Republican refugees escaping Franco’s troops, hiding them temporarily on his estates.’ When the Second World War began Victor Hunter Reynolds volunteered to fight in the British army but instead was asked to stay in Portugal as a useful secret agent. Many refugees from different countries, fleeing prisoners of war, RAF pilots who had been shot down and other agents passed through the Quinta do Carmo on their way to Lisbon and Britain. Alberto Franco goes on to describe a caring and generous landowner who understood the hard conditions his workers endured and goes on to say, ‘his reputation as a good man and a just employer turned to his advantage during the Agrarian Reform. His properties were not occupied, although he had certain difficulties, as might be expected.’ I felt privileged to have been able to learn a little more about the people of this lovely part of Portugal thanks to this memorial bench. 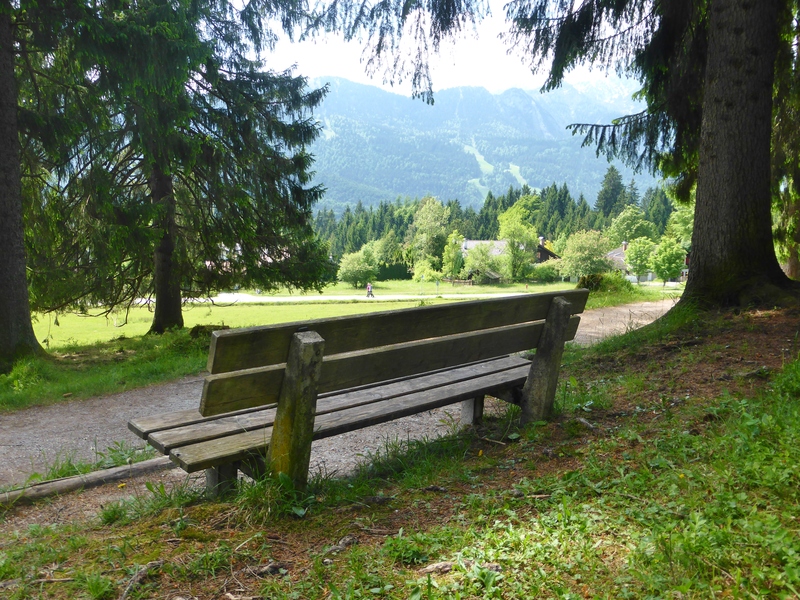 I have generally only included benches from my travels in the United Kingdom but this one on the lovely Kramerplateauweg (Kramer plateau walk) above Garmisch-Partenkirchen was hard to omit. This is partly because memorial benches do not appear to be as common in other countries as they are in the UK and so the opportunities do not arise as often and also because we generally only visit foreign countries once a year for our ‘big’ holiday. 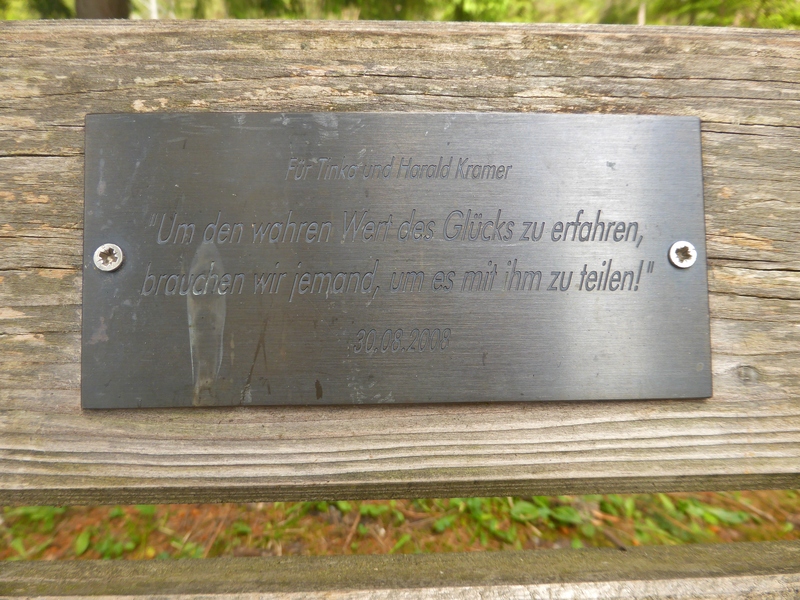 This memorial bench to Tinka and Harald Kramer is beside the path on the Kramerplateauweg. This path gives splendid views across the flat and green valley floor to the rugged mountains around the Zugspitze, the highest mountain in Germany, and is one of the most beautiful walks that is easily accessible. We were in Garmisch-Partenkirchen for some walking in the mountains and our visit was only a few days before Angela Merkel and Barack Obama came this way. They and numerous journalists and security took time out from the G7 meeting that was being held nearby to see this spectacular view. Although we really like this area and the walking is good, we felt that most of the German police force were in and around Garmisch-Partenkirchen and we didn’t stay as long as we intended. This sentence tells passers-by a snippet of a story about a happy couple who have been remembered by this bench.